The Lumix DMC-GH3 uses a new OLED EVF that has a 1.744-million-dot resolution and is supposedly 8x faster than the one in the GH2. As for quick panning, the response time has definitely been improved from last time round. We liked the display of the GH2’s screen, and the crisp detail of the GH3 display is even better, although not quite as good as the best in class. 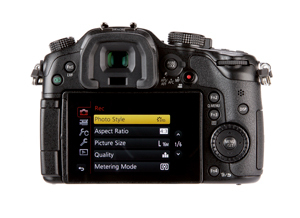 In use, the eye sensor underneath the finder can be employed for switching between rear screen and finder when the camera is placed to the eye, and to perform AF when the EVF is initially in use. There is a short lag between putting an eye to the viewfinder and the display appearing, and in this respect the best Sony EVF still has the edge in response time. The rear screen has all the three key features that today’s best screens offer. First, it’s an OLED type, which means the display is bright and crisp. Its resolution may well be a tad low at 614,000, but in practice this does not bear any discernible downside on the output. Second, the screen is articulated from a hinge point on the side of the camera, which aids viewing from a number of different angles. Finally, it is touch-sensitive. I have been a fan of Panasonic’s touchscreens in its CSCs for some time, and here the GH3 goes one better, being a ‘capacitive’ type. Usually found in smartphones, these rely on electrical charges from your fingers to detect when and where on a display the user is touching. The touchscreens used in other Panasonic cameras are of the ‘resistive’ type, which requires a firmer push rather than a light touch. The screen really is responsive for touch shutter and touch AF, resulting in reduced camera shake. Navigating the menu is intuitive via the touchscreen, too, thanks to page breaks for skipping onto the next page, viewing images by pinching to zoom in and out, and swiping to go on to the next image. With such a positive response to the GH2 from video makers, Panasonic has gone to town with refinements to the video capabilities of the GH3. For more details, see Video capture.